You may use an alphanumeric token to see restricted content using RSS Feed Readers or other simple content viewers. This token authenticates your user account, and as unique to you. If you have reason to believe someone else is misusing your token, please press the Reset token button to get a new one, and update your RSS readers. This report is from Lynne Ward from the City of Subiaco who was kind enough to pen it for me as I have been overseas for some weeks. The launch of the Pilgrims Trail trailhead, the starting point of the new heritage walking trail between Subiaco and New Norcia, was officially launched by the Mayor of Subiaco, Heather Henderson on Sunday 8 December 2013. The trail now stretches some 170 kilometres from Subiaco to the monastery town of New Norcia in the north-eastern wheat belt. The marked trail has been initiated and developed by the Pilgrims Trail Foundation and takes its inspiration from the extraordinary life of Benedictine monk Dom Rosendo Salvado, the founder of the New Norcia Benedictine monastery, who walked between Subiaco and New Norcia on many occasions during his 54 years at New Norcia. A QR code etched on a small plaque located at the trailhead links to the Pilgrim Trail Foundation blogsite. The trailhead for this walk was developed by the Pilgrims Trail Foundation in partnership with the City of Subiaco and St Joseph’s Subiaco and is located in the newly named Piazza Salvado forecourt at St Joseph’s Subiaco, 3 Salvado Road, Subiaco”. It looks like we have a site for a Trail Head in Subiaco. 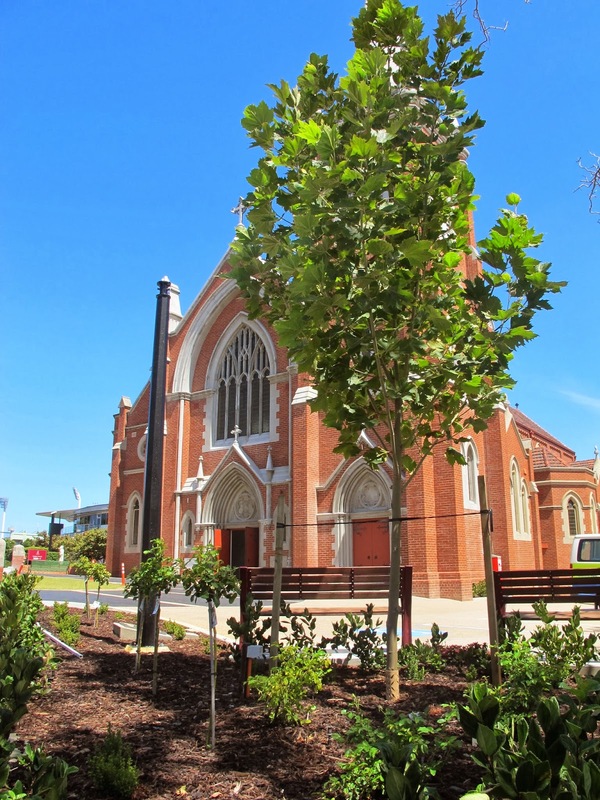 After discussions with the City of Subiaco and St Josephs Church, site was found in the newly re-developed area at the front of the Church, that has now be re-named Piazza Salvado. Domenic at Granite & Marble Expo in Osbourne Park, was fantastic with his help in sourcing and supplying a suitable piece of Granite and then getting it engraved. We owe him a huge vote of thanks. The official blessing is on Sunday 8th December at the 10.00am Mass, so please come along and join the fun! My colleague Colin Ingram and I had a very good meeting with the Head of the Department of Parks and Wildlife, Western Australia where we discussed the idea of forming a Community Partnership in all things related to the Trail and the significant areas that it runs through. Fingers crossed that all goes well because that would be a huge fillip to our future growth. We have tenders out now for an Official Web Page which we hope to post early in the new year. All ideas and suggestions will be gratefully received. An idea is germinating that we organize a “Big Event” on the trail for 2014 – so if any sports or sponsors are reading this, we’d love to cooperate on a big event. Last week a meeting was held at the Department of Sport and Recreation to review the impact of the Pilgrims Trail on the Monastery town of New Norcia. New Norcia is unique in Australia, but like the rest of Australia, it continues to evolve and survive in its sometimes difficult, rural setting. It is a fragile Community with a deeply spiritual focus which makes it even more precious in these economically driven times. The Pilgrims Trail, as indicated in its Mission Statement , aims to “Establish a permanent Trail between Subiaco and New Norcia which is respectful of the local environment and cultures….” and following our discussions, it was decided that until a permanent trail was fully functioning –which realistically was thought to be about 3 years away- walkers should only consider following the Trail in groups; and that these groups should liaise well in advance with the Community at New Norcia, so that no unnecessary strain was placed on their already constrained resources. However, should walkers wish to follow the lower part of the trail over one, two or three days then they would see a part of WA which is quite beautiful and just on the doorstep of the City: the glorious Swan river: Bells rapids through to Walyunga National Park, and walking the Chittering Valley is a very different experience to driving through it!! The Parish of St Joseph’s in Subiaco has already penciled in two dates for their Camino Salvado in September 2010, and we continue to work on moving the trail away from the Great Northern Highway and make the experience even more enjoyable for them. In the near future we hope to apply for funding to take this project to the next level: we need your support, encouragement and where possible your active involvement so please use the comments section to let us know what you can do to help create a little piece of history for all West Australians.